Rafael Nadal: "I would love to know Colombia"
The world number one will play the holiday Monday in Bogota against Serbian Novak Djokovic. The Spanish Rafael Nadal is happy to know Colombia said. The world number one will play this holiday Monday a friendly match against Serbia's Novak Djokovic, three of the ATP, in the Coliseum El Campin in Bogota, and said she always excited as a visitor for the first time a country. Winner of 43 titles, nine of them Grand Slam (Roland Garros five, two Wimbledon, one of Australia Open and U.S. Open), Nadal reach as Monday from California, where he plays the tournament in Indian Wells, where today facing the Indian Somdev Devvarman. What do you expect in this visit to Colombia? The truth is that I am very excited because I've never been in Colombia, a country that everyone has told me fantastically. So I am excited to enjoy and play the game Bogotá friendly Djokovic. How had the opportunity to come to Colombia in two tournaments as important as the Indian Wells and the Sony Ericsson? Obviously the timing makes it difficult and did not play a tournament about what makes Colombia a little more, but hey, it was found that date, which seems appropriate. What is your opinion of the Colombian Santiago Giraldo? It is a very young player that has a very high potential. The last year and a half has done very well. He still has a ways to go and everything to get higher. What was it like filming the video for 'Gypsy' with Shakira? It was a beautiful experience, not every day you are invited to record a video with someone as important as Shakira and the way to know a new world. Shakira was very grateful for giving me the opportunity to live this experience. Are you obsessed with the challenge of winning all four Grand Slam titles in one year? Not at all, that I see practically impossible, difficult, and the truth is that my ultimate dream is to remain competitive every time I go to a tennis court, improve my game and still enjoying it.Many things I love about my life, but now it gives me most pleasure is the tennis. Injuries have plagued him several times, is now not to repeat dosing? When I go to a track I do not think anything like that, or injuries or maintain my physique. I go to give everything and try to do my best. If after injury is, because I just think this is part of sport. Everyone has injuries, it is impossible to play at the highest level and not having them, simply because you carry the body to the limit and that we must accept and try to recover as soon as possible. Historically, the Spanish are contained in the clay, are they more difficult to play on other surfaces? That has changed a lot, I think the Spanish players are becoming more complete and are more prepared to play on all surfaces. What happens is that obviously the clay has always been our mother and a tad less complicated to play on other surfaces, but that does not mean that we have managed to fast track some very excellent results. Do you now see more of a rival in Roger Federer or Djokovic? At the end of the day are all competitors, one can not say that there is one more difficult than another. 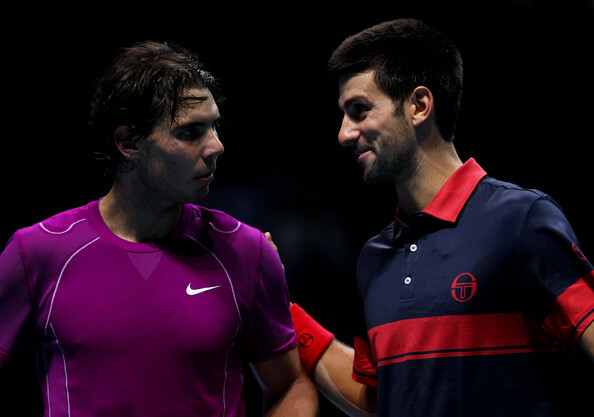 Think Djokovic or Federer will face is knowing that in a semifinal or final, because that is where I find them. The touch you will always be complicated and depend on when the level of mine and theirs. How a young man living with so much success? I just try to live day by day, know that difficult times will come to be overcome. The daily illusion is to be better and make my dreams come true. That's what helped me get where I am. "An exhibition game is played as such or if there is demand from the two protagonists? The exhibitions are just that, but that does not mean that when we play we do not want to do our best, we give a good show for people who come to see us. That is the reality of the situation. What I hope is that we spend a good time and the truth is that I'm very happy to go to a new country. "The truth is that I am very excited because I have never been to Colombia, a country that everyone has told me fantastic things about," the nine-time Grand Slam champion told El Espectador Wednesday. The Spanish world number one is due to play the Australian Open-winning Serbian on Monday 21, March, following the conclusion of the Indian Wells ATP tournament currently taking place in California. Should Nadal live up to his billing as the world's best player, it could mean that he plays the final just one day before arriving in Colombia, although the Majorcan appeared unfazed by the tight schedule, even with the Sony Ericsson Open due to get underway in Miami a few days later. "Obviously the calendar makes it difficult, and that there is no tournament played near Colombia complicates it a little bit more," he , before adding that the date nevertheless "seems appropriate." He also spoke highly of Colombian tennis prospect Santiago Giraldo, noting that he "is a very young player with very high potential." Nadal hopes to continue his progress in the Indian Wells tournament today with his fourth-round match against the Indian Somdev Devvarman.